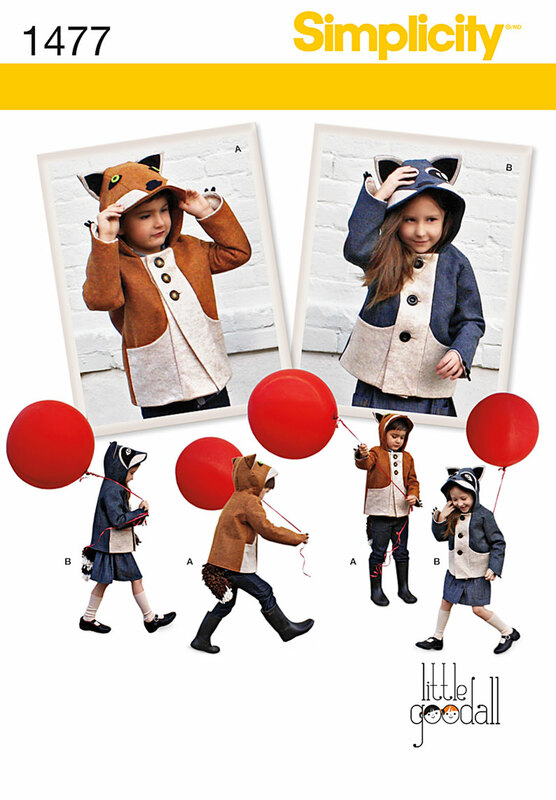 If you haven't come across these fabulous felt animal coats by Little Goodall, then where have you been?! They are absolutely amazing, but they are well out of my price range, unfortunately. I was extremely happy to find, however, that they had teamed up with simplicity to offer a sewing pattern for these unique coats! You can find them here. I think I purchased mine through Jaycotts when there was a sale on, so I managed to get the pattern for less than usual. Yay! I purchased the pattern months ago, like seriously, a looong time ago when Rori was a wee dot. 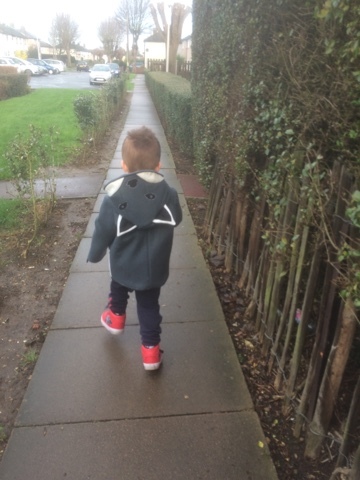 I had always intended on sewing a coat for Logan for Christmas, and this was exactly the right project! When I went on the fabric shopping trip to London's Goldhawk Road in the summer, I managed to get all of the wool felt fabric that I needed for around £30. Bargain! 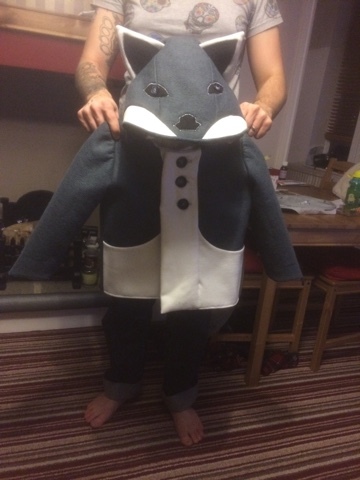 I had decided to go for View A, which is supposed to be a fox, but make it in grey so that it is a wolf coat. I must admit, before I go into any detail, I have soooooo pleased with the coat! It is by no means perfect, but it was a really challenging make for me, and I just love it. Not only am I suprised that I actually managed to make it, but I did it in one day! It nearly killed me, but I did it in one go. Woohoo! I started by cutting out all of the pieces in one weekend. That took an age in itself and blunted my scissors. 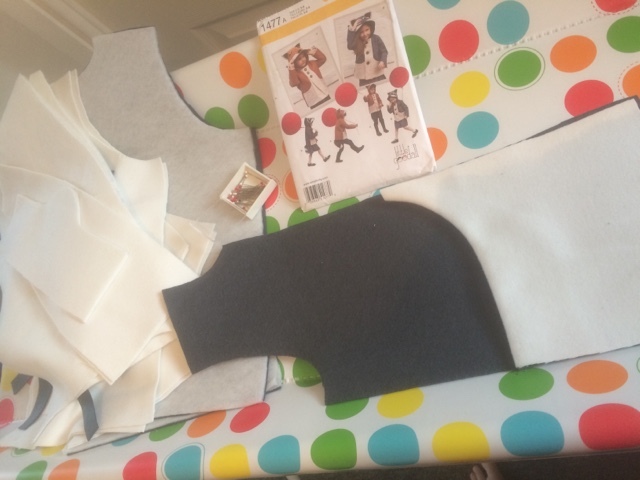 I was incredibly glad that I had taken the fore site to cut the coat in a size 5, even though Logan is only 3, as then at least it will last a while and I wouldn't have to go through this again any time soon!.This pattern calls for fusible fleece interfacing, which was alien to me until this project. A different weekend I had put aside time to start the sewing, but the fusing of the fleece to the fabric took so long that I didn't have time for any sewing! 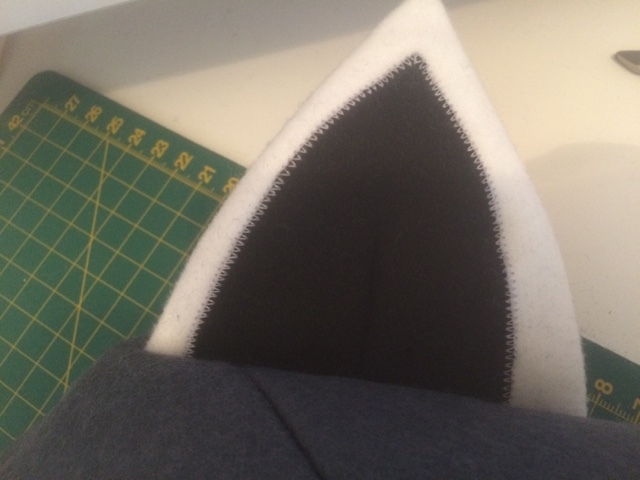 Seriously, I don't for the life of me know what I was doing wrong, but it took FOREVER for the fusible fleece to fuse! I don't know if it's because the wool was thick and the iron had to be on a low-ish setting as to not burn the fabric, but my god....I almost gave up there and then. I started to loose interest and put other projects in front of this one, and then I worried that I wouldn't have the time to sew it. So on the 20th December, I gave myself just that one day to sew it, start to finish. 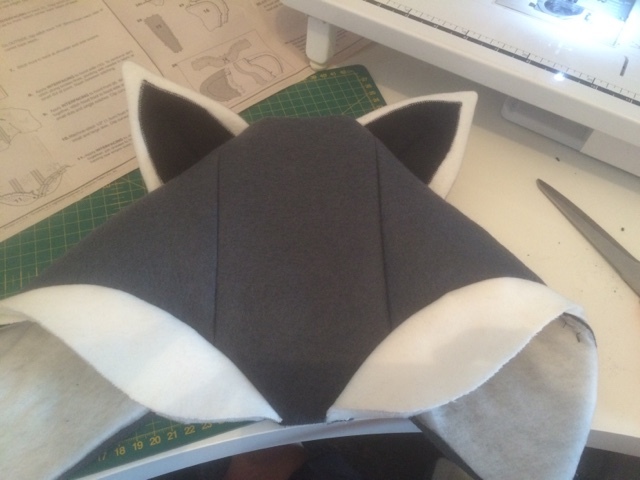 I had to use a walking foot as the layers were really bulky, and my machine still struggled at times. I managed to break 3 needles on those bulky seams! I also ran out of dark grey thread, so had to opt for a light grey thread. 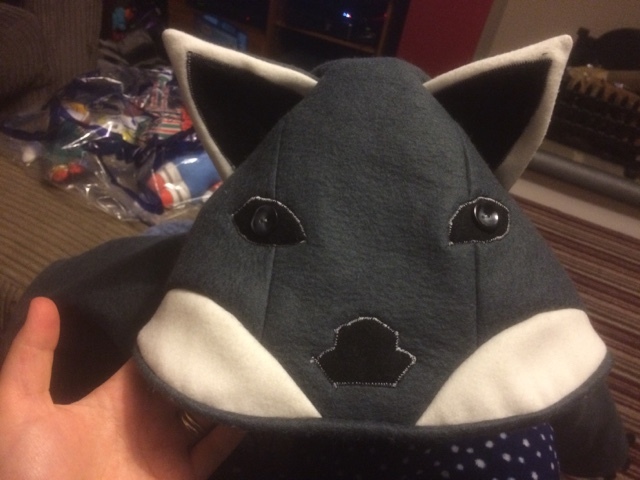 I actually kind of like it as it gives some highlight to the applique face detail on the hood. 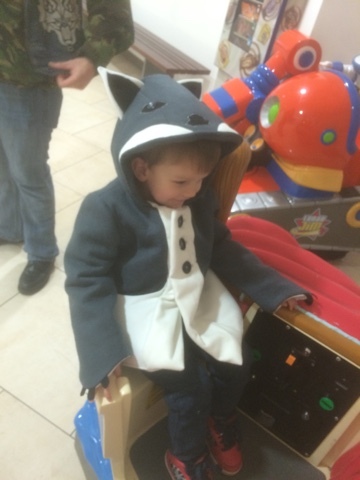 With all that aside however, the pattern instructions were clear and the coat did come together nicely and quickly. 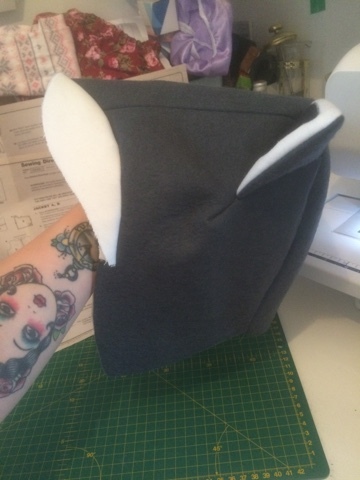 The only mistake I made is when I was setting the sleeves into the lining and I was talking to my Mum on the phone at the same time, and I managed to sew the sleeve inside out! Ahh! But by that point I just couldn't be bothered to unpick the whole sleeve and start again so I just left it. Noone will notice unless they look inside the coat at the inside of the sleeve, so let's keep that a secret, OK! I felt a massive surge of pride and triumph when I had finally finished this coat. Yes, it's imperfect, but that just adds to the home-sewn charm, right?! It's a bit weird, a bit wonderful and a bit quirky, just like Logan and I, so I figure it's pretty fitting! Best of all, Logan really loves it. 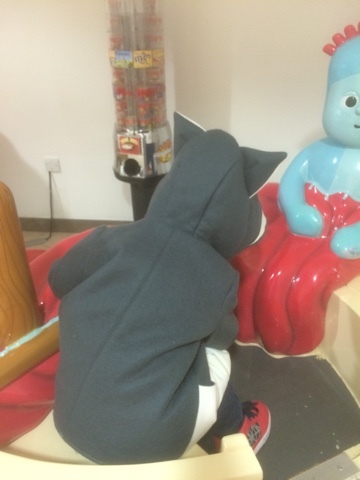 It's surprisingly warm because of the fleece interfacing, the wool felt and I also lined it in a soft felty-fleecey type fabric, so he's actually been able to wear it in this horrid weather. His favourite part of the coat are the little claws on the end of the arms, which he pretends to claw at me and Rori with. Cute...?! The arms, by the way, are genious. 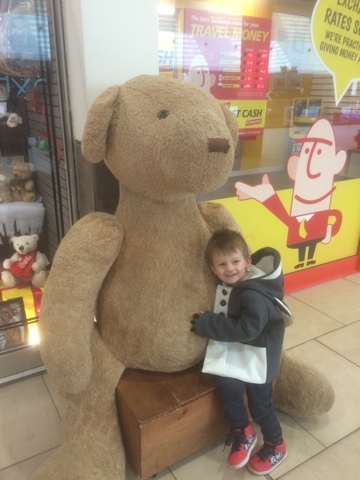 They are elongated at the front by the hands, so Logan doesn't even need to wear gloves with it as it keeps his little hands tucked up nice and warm. 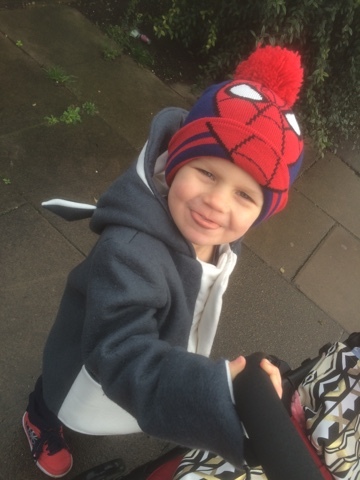 The hood fits nice and snug, so it won't be one of those annoying ones that keeps falling down, and he has got lots of room for it to last a good while. I think this is my favourite thing I have made, ever. Hoooooowwwl!